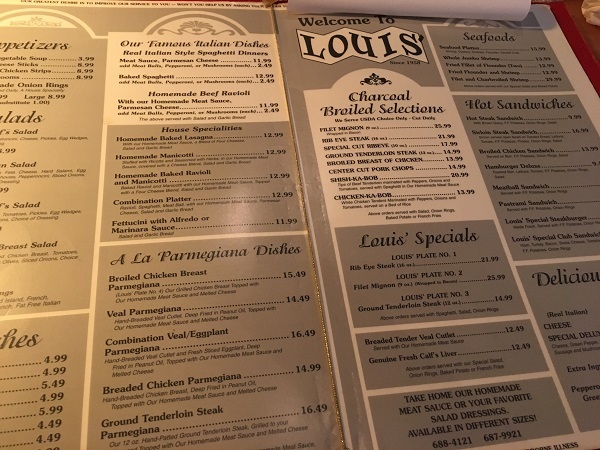 The Original Louis’ Drive-In Restaurant, Knoxville TN – Marie, Let's Eat! Poor reading led to a misunderstanding, and so we didn’t come to this old favorite for the right reason, but it turned out okay. We made a very neat discovery. When I was picking a spot for our supper in Knoxville, I was juggling a couple of possibilities downtown, but on a whim, I Googled to find the oldest restaurants in the city. We’ve certainly been to quite a few old places around Knox County, but The Original Louis’ Drive-In Restaurant had never been on my radar before. I read, hastily, this 2013 story by Mary Constantine at KnoxNews and made a mental fumble that demanded our immediate visit. Here’s where I fouled: go read that fourth paragraph in Constantine’s story. You’ll see that there was once a competing restaurant, cheekily named Louis’ Inn, that was owned by some other people. Among them was Gus Peroulas, and that name rang a bell. He was one of the founders of one of our favorite Knoxville restaurants, the delightful Pizza Palace. I absolutely love their spaghetti’s meat sauce. I’m crazy about it. 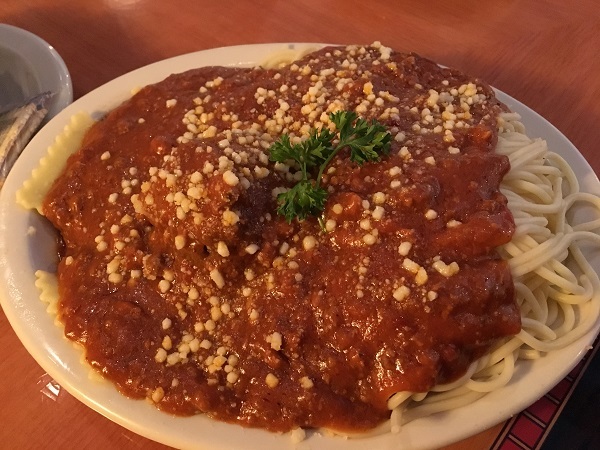 I’d love to visit another restaurant in town and try that, and I just knew that our spaghetti-loving six year-old would also like it. Ah, but since you’re a more careful reader than I was, you spotted that Gus Peroulas never had anything to do with this restaurant. Nevertheless, the misunderstanding is a persistent one, and it’s not just this loudmouth with a blog getting things wrong. When we paid our bills, I asked about the family connection, and the girl at the register replied “That’s just a weird rumor. 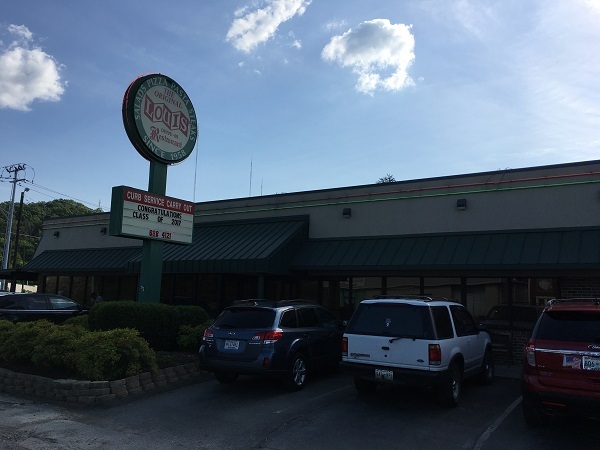 Lots of people say that, but it’s not true.” In fact, a couple of weeks later, I was talking about Knoxville restaurants with a client at work, and she also believed that Pizza Palace and The Original Louis’ Drive-In are related. To make a long story short, the meat sauce is here is not quite what I was expecting. It’s a little bit different. In fact, it’s quite different to just about any meat sauce over pasta that we’ve ever had before. We arrived about 5:15, expecting a slow house because that’s kind of early for dinner. That was our second misunderstanding of this place. It was better than three-quarters full when we got there and a line was waiting when we left, so if you’re in the mood for great big servings of Greek-Italian American meals, come early. I was fascinated by this place. It’s a trip back in time, before the standard “everything with red sauce” restaurants forged our stereotype of Italian food, while also providing reminders that many of the restaurant traditions in the south came from Greek families and their interpretations of what the locals might like. It’s an interesting menu. You certainly don’t see calf’s liver at too many big family restaurants. Since Marie and our son were both having pasta and sauce, I decided to have a pastrami sandwich. Then the plates came out and I was surprised. This was nothing at all like the sauce I was expecting. In fact, it is a whole lot closer to Cincinnati-style chili, which you’ll recall is also of Greek-American origin, than to anything you can get in a jar from Ragu. It is certainly thicker than Cincy chili, but it has a very similar flavor profile. Our server would not share a single ingredient – her boyfriend actually makes it, but he won’t tell even her what’s in it! – but we could certainly taste the cumin in this. My sandwich was terrific, with really tasty pastrami and freshly-baked crusty bread. The fries were just frozen delivery service stuff, and a real letdown after our great lunch, but the onion rings, in a weird coincidence, since I got the family connection totally wrong, were similar to what I was expecting. These are completely delicious, soft and flaky. They’re really, really like the rings at Pizza Palace, which is just as fine as fine can be because I totally love those onion rings. 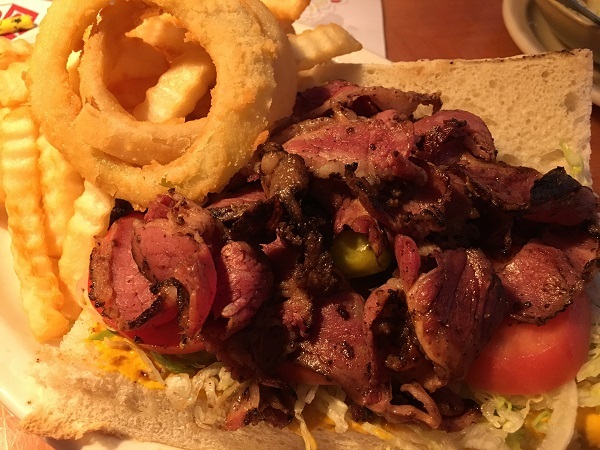 The pastrami is cured in-house and makes for a killer sandwich. I would happily come back here for another sandwich and a large order of rings. Having just two was fine for this visit, but give me a big plate of those and a small salad and I’ll leave happy. That wrapped up a pretty nice day trip to Knoxville. I probably ate a little more than I should – the Döner kebab sandwich at GruJo’s was an indulgence – but we logged three miles of hiking and some pretty good exercise at The Muse, so we’re doing a little better about being more active on day trips and not just gobbling food all day. We may be back in Knoxville again later this year and I’ve got a couple more places on my radar to try. Do you have any recommendations, readers? Posted on July 18, 2017 by Grant G.Posted in italian, knoxville, tennesseeTagged italian, knoxville, onion rings, tennessee.